Chloe goes to see Darcy to tell him what's going on with her family. The children have taken the news of their relationship very hard. She wonders if she can just cut John out after so many years together. Darcy asks what she wants and acknowledges it's not simple. Michelle's panicking because she's leaving so soon. Connor asks for them to have some time alone before they goes. Flick reminds her she'll be there with her too in another couple of weeks. Lyn's preparing a special meal. As Chloe leaves, Darcy tells her he's available any time if she needs to talk. Toadie comes and makes it clear he's heard John Lambert's back so he understands why Darcy's feeling down. Nina and Stuart are at the Scullys' for the special goodbye dinner. Nina has received another message from her secret admirer, who wants to meet her at Grease Monkeys the following day. Over dinner, Joe asks about the place Stuart and Flick are going for their holiday. It's quite far, remote and has some mystery murder story behind it, but is safe, according to Stuart. Toadie has gone with Darcy to the pub to hear him talk about his problems. Darcy asks about him and Dee. Toadie thinks she's probably at home having a quiet night at home, because she's so tired all the time-even when he organised a romantic night for them. Darcy reassures him that Dee's straight out and would say if there were something wrong. Jordan Lambert arrives and says it's Darcy she was looking for, not her mother, who's with John. At the Scullys', Joe's just made a goodbye speech to Michelle and made a comment about both her and Jack being away, so it'll be pretty boring in Erinsborough, when there's a knock on the door-it's Jack. Everyone else greets him happily, but Joe is wary. Jordan wants to know if Darcy plans to make a scene now her father's back. Darcy dismisses her, saying it's between him and her mother, but she insists that's a cop out, the relationship is just a fling and he's only a distraction. She tells him to get on with it and get on with her marriage. He replies that it's not a game-he's not going to walk away. She feels her mother might walk away from him, but he answers that what matters most is her mother's feelings, not hers. Even if their relationship fails, she may not go back to John and her mother is a grown woman whose choices must be respected. Jordan asks him to end it then when he says he won't, tells him he'll regret it. Toadie doesn't believe him when he says it was all about 'nothing'. The Scullys, Stuart, Connor and Nina tease Jack about his Kiwi accent, which he has apparently acquired by spending so much time with his girlfriend Lori. Lyn comments that she didn't know they were so serious and makes a big fuss of him, but Joe's a lot cooler and wondering why he couldn't get his injury treated and stay in light training and physio. Jack changes the subject instead. Joe just looks thoughtful, but a bit pleased as Michelle and Jack tease one another. Michelle and Connor pack some food and bedrolls and go off into the night. Lyn has obviously worked it out but doesn't let on to Joe and stops him going off to investigate the noises he heard. Darcy is flat on his back on Toadie's couch, snoring loudly so Stuart emerges, asking if it's something Dee should know about. Toadie tells him Darcy was depressed that his lady friend might be getting back with her husband makes full barside confession, leading to tragic devastation of friend's couch. Stuart agrees to wake Darcy and get rid of him before Dee gets up, as he and Flick are setting off early on their trip. Toadie asks about taking her to 'ghost country' and Stuart asks if he's ever taken a girl to a scary movie? 'Yes, it's pretty embarrassing. I end up screaming and climbing all over them and stuff'. He realises Stuart's aiming for the 'same thing but the other way round'. In the rotunda, Connor and Michelle discuss staying single when she' away and reminisce about their first meeting. He gives her a tape he's made for her and says he's done a lot of running in his life, now she's running from him. She reminds him it's just for a year and they kiss. The following morning, they wake just as Joe runs past, but he doesn't see them. Lyn's packing food for Flick and Stuart, who are about to leave. They will be outside mobile range, but they like the side of the isolation and just promise to contact her when they can. Lyn gives them a cover story so Joe won't realise. Chloe meets Darcy in the coffee shop and tells him she just doesn't love John any more, so reconciliation isn't on the cards. He admits he can't remember his good night out with the boys, but thinks he drowned his sorrows because he thought he was going to lose her as a friend. Jordan comes and joins them. Chloe thanks her for handling this like an adult and supporting her. She apologises, saying she bit Darcy's head off and was out of line, but as soon as Chloe has left, reverts to her previous attitude, saying she told him to leave her alone-it's not going to last and she'll make sure of it. Flick's driving the campervan while Stuart dozes. They chat about getting there in a few hours and she doesn't see some road-signs on their side of the road. 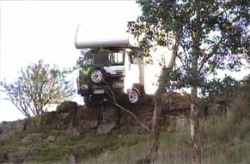 He pulls at the wheel, but the van hits them and careers off, coming to rest at the edge of a steep embankment. It's swaying and Stuart makes Flick slide back and out through the side door. As she gets out the van plunges down, bits flying in all directions and finally comes to rest against a tree at the bottom. Flick screams out to Stuart but there's no sign of him.